Angry Robot is HarperCollins’ new imprint devoted to all that’s new in SF, F and WTF?! (hmm must be a Press Release term...) Publishing worldwide, as books, eBooks and downloadable audio, its mission is to bring a contemporary edge to traditional genre fiction. 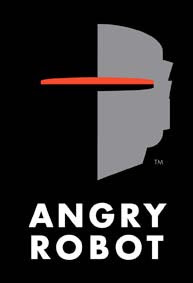 Angry Robot launches in the UK in July 2009, and in the US and the rest of the world from September. Ebook editions will be available worldwide from July. Its first titles are a mix of genres, from street smart neat-future thriller to ultra-dark horror to wild modern fantasy. Its authors, too, fulfil its mission: two men and two women, two new writers and two established, and from all corners of the globe – in this case the USA, Fiji and South Africa. Here is a little preview of the dark urban fantasy title by Tim Waggoner called Nekropolis. His mean streets are the city of the dead, the shadowy realm known as Nekropolis. And in this first case, Richter must help a delectable half-vampire named Devona recover a legendary artifact known as the Dawnstone, before it’s used to destroy Nekropolis itself. That is, if he can survive the myriad horrors that infest the city itself. Pulp and proud, cracking wise like we just dug up the rotting corpse of Dashiell Hammett and put him back to work at his typewriter, Nekropolis is just the first of a series of extraordinary urban fantasies Angry Robot will be bringing you from the mighty Tim Waggoner. 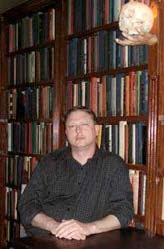 Tim Waggoner is a novelist and college professor. His original novels include Cross County, Darkness Wakes, Pandora Drive, and Like Death. His tie-in novels include the Lady Ruin series and the Blade of the Flame trilogy, both for Wizards of the Coast. He teaches composition and creative writing at Sinclair Community College in Dayton, Ohio and is a faculty mentor in Seton Hill University’s Master of Arts in Writing Popular Fiction program in Greensburg, Pennsylvania. Angry Robot gives out ARCs to review! Sign me up. Heh I just did. LOL KB good luck with that. Look forward to your reviews. Ana it's funny that they say publishing is in trouble but here is a new imprint despite all the doom and gloom. Good show for UK publishing! Yep, but wasn't there an article somewhere last week (not very helpful, I know. Sorry) saying that genres like romance and sci fi and fantasy have seen an increase in sales despite the crisis? so. I guess they are banking on that? Ana I've heard it said the escapist fiction (mainly genre) always does well in recessions. Personally I think it does well all the time but I don't have the stats to back that up.